Draft: 2003, Kansas City Royals, 7th rd. Resides in Santa Clara, UT during the offseason with his wife, Jessy, their son, Madden, and their daughters, Kyla, and twins, Adriana and Maiya. Attended Concordia (NY) College, where he was named Rawlings/ABCA Position Player of the Year and Rawlings/ABCA Division II Player of the Year as a senior after leading all Division II players in batting average (.500) with 20 doubles, six triples, 22 home runs and 65 RBI in 45 games. Completed his third full season with the Cleveland Indians in 2015, playing in 98 games. Saw time at five different positions for the Indians, appearing in 34 games in left field, 28 games at third base, 23 games at shortstop, 11 games at second base and five games in center field. On bereavement list from May 8-15 and moved to the restricted list from May 15-18. Recorded the seventh four-hit game of his career on May 21 at the Chicago White Sox. Hit .298 (14x47) with eight runs scored, two doubles, one home run and four RBIs in 15 games during May. Blasted a go-ahead solo home run in the 10th inning on July 2 at Tampa Bay. On bereavement list from July 11-16. Finished the month of September with a .286 (12x42) batting average with eight runs scored, two doubles, one home run and four RBI. Spent second full season with the Indians and was again a jack-of-all-trades asset, spending time at six different positions, adding center field and right field to his repertoire...Appeared in 33 games at second base (28 GS), 36 games at third base (28 GS), 15 games at short stop (12GS), 27 games in left field (17GS), 3 games in center field (1GS) and 3 games in right field (2GS)... Over his 88 starts the club compiled a record of 48-40 (.545). Enjoyed his first career walk-off home run on August 15 vs. Baltimore off Brian Matusz, an 11th inning solo shot that gave the T ribe a 2-1 win...F rom August 19 thru the end of the season he hit .263 (20-76) with 5 2B, 1 HR and 10 RBI in 27 games but batted just .215 (31-144) in the second half....Hit .272 (50-184) with the bases emp ty and was 3rd on the team with 14 steals in 19 attempts. Finished 14th in the American League in batting average with 2 strikes (.242, 38/ 157) and was 3rd in the league behind Jose Ramirez and Brett Gardner with 11 sac hits...Missed 9 games from Sep t 2-10 with concussion symp toms suffered on Sept 1 vs. Detroit diving for a ball in right field...Best month was May, hitting .301 (28-93) with 6 2B, 2HR and 16RBI in 25 games (2nd on the club in RBI in May to Brantley's 19) ... Hit .269 (47-175) in 56 games in the 9-spot in the batting order. Spent first full season in Cleveland after being acquired in the off-season from Toronto...Came as advertised, providing solid play at a variety positions for Terry Francona's Indians...Made 35 starts at shortstop (46 games), 37 starts at third base (56 games), 11 starts at second base (12 games) and made 4 starts in left field...Started 19 straight games at shortstop from June 4-25 when Asdrubal Cabrera was on the 15-day DL...Played for Team Puerto Rico in the World Baseball Classic and hit .323 (10-31) with a double, home run and 9RBI in 9 games for the WBC runner-up PR squad... Was T5th in the WBC in hits and T2nd in RBI among all players…Also played in 2009 for PR in WBC...Collected a single-game career-high 5RBI on April 28 at Kansas City (night game) and hit .300 (12-40) in 17 July games with 9 runs scored and 3RBI...Hit his first career grand slam on Sept 1 at Detroit off Joaquin Benoit to break a scoreless tie in the 9th inning and snap a 5-game losing streak...Hit .241 (35-145) in the second half of play (50G, 17RS)...Hit .232 (51-168) with runners on base...Was 7-for-46 (.152) over his last 17 games after Sept 7... Was tied for 5th in the American League with 8 sac flies and tied for 10th in sac bunts (7). Spent 1st full season with Boston in 2012 and set career highs in games (136), at-bats (512), doubles (28), home runs (13), RBI (60) and walks (23) and matched career highs in extra-base hits (41) and stolen bases (14)...Was the team's primary shortstop for most of the season, making 123 starts and 128 appearances at the position overall...Made 1 start at 2nd (2 games overall) and 3rd base in September...Also made 5 starts at DH in late August and early September. Ranked tied for 3rd in AL with 13 HR and 6th with 59 RBI at shortstop...Was also 7th in the AL at short with 40 extra-base hits...Became the 1st Red Sox shortstop with double-digit homers and steals since Nomar Garciaparra in 2003 (28, HR, 19 SB)...His 13 HR were the most for a Sox SS since Garciaparra in 2003...Was the 7th-hardest AL player overall to double up, going 85.3 at-bats per GIDP (512 AB/6 GIDP)...Hit .321 (18-for-56) with 2 outs and RISP, 11th in the AL (min. 50 PA)...Batted .286 (42-for-147) with a .429 SLG off lefties compared to a .236 clip (86-for-365) and .362 SLG off righties. Made a career-high 36 starts in the leadoff spot and knocked 8 homers in those games, the 10th-most home runs in the AL while batting in the 1-hole...Finished April with 5 homers and 17 RBI while hitting .291 (25-for-86)...Marked his most RBI ever in a single month and 2nd-largest home run total (6, Sept. 2010)...Matched career highs with 4 hits (6th time), 3 extra-base hits (2nd time) and 2 doubles on April 24 at MIN...Ejected for 1st time in his career on 5/17 at TB by HP umpire Dan Bellino after striking out to end the 7th inning. Hit 1st 2 career leadoff homers in consecutive games, 5/19-20, both at PHI...According to Elias, the only other time a Red Sox hitter had a leadoff homer in consecutive games was Harry Hooper in both games of a doubleheader on 5/30/1913 at WSH...Homered in a career-high 3 straight games overall from 5/18-20, all while batting leadoff...Became the 1st Sox leadoff man to do that since Felix Mantilla, 9/18-20/1964, and the 3rd with Boston overall since 1918 (also Roy Johnson, 6/27-28/32)...Prior to being acquired by Cleveland he was traded from Boston to Toronto on October 21 in exchange for RHP David Carpenter as compensation for Manager John Farrell. Hit .317 (32-for-101) in 38 games for Boston after being acquired from Kansas City on 7/30...Combined to slug .576 against left-handed pitching, 10th best among American Leaguers with at least 85plate appearances vs. southpaws...His .318 AVG (27-for-85) against lefties ranked 16th-best among that group...Stole 14 bases, tying a single-season career-high (also 2010)...Was successful in 4 of 6 stolen base attemptswith Boston...Swiped 2 bags as a pinch runner...Went 41-for-185 (.222) with with Kansas City prior to the trade...Was optioned to Triple-A Omaha on 6/9 andhit .307 (43-for-140) with 8 doubles, 2 triples, 9 home runs and 25 RBI in 35 games with the Storm Chasers...Following a 7/20 recall to Kansas City, went 37-for-117 (.316) in 44 games between the Royals and Red Sox...For Boston, appeared at 3rd base, shortstop, 2nd base, right field and left field...Started in right field on8/6 vs. NYY, his 1st game in the outfield as a professional, and made his 1st start in left field on 8/26 vs. OAK...His .317 AVG with Sox ranked 15th among AL players from 7/30 through the remainder of the season (min. 100AB)...Hit .364 (28-for-77) in his 1st 30 games with the club through 9/18 but went 4-for-24 (.167) the rest of the season...Hit .444 (16-for-36) over 16 games from 8/27-9/20, the 2nd-best AVG in the Majors in that time (min. 35 PA)after Texas' Mike Napoli (.448)...Homered twice in a 3-game stretch, 9/16-18, his 1st 2 shots with Boston...His 1st Red Sox homer, a soloshot in 4th inning on 9/16 vs. TB, proved to be the winning run in a 4-3 victory...Snapped a 54-game homerlessdrought, the 2nd longest of his career after 80 games from 5/11-9/12/10 with KC...Following the season, hit .289 (11-for-38) with 3 doubles, 2 homers, 5 RBI and 8 walks in 10 games withLeones de Ponce of the Puerto Rico Baseball League, including 9 starts in right field. Less than nine months removed from Tommy John surgery on his right elbow (July 7, 2009), Aviles made theRoyals opening day roster before being optioned to Omaha on April 11...he returned on May 3 and served as theprimary second baseman the remainder of the season...Led all of baseball with a .412 average (42-for-102) and .450 on-base pct. leading off an inning (min. 100 at batswhile leading off)...Recorded 12 extra-base hits (5 2B, 1 3B, 6 HR, .648 SLG) over his final 20 games of the season after posting just15 (11 2B, 2 3B, 2 HR, .351 SLG) in his first 90 games of the season. Made his first Opening Day roster as Kansas City's starting shortstop...made 33 starts at shortstop and one at third...batted .183 in 36 games before going on the 15-day D.L. with a right forearm strain on May 23...Underwent season-ending "Tommy John" surgery on his right elbow on June 8...was transferred to the 60-dayD.L. on July 7. Named the 2008 Les Milgram Royals Player of the Year after bursting onto the scene as a rookie...became thethird rookie to win the award, joining Bob Hamelin (1994) and David DeJesus (2004)...Finished tied for fourth in the A.L. Rookie of the Year voting...Was 1 of 3 fi nalists for the American League Players Choice Outstanding Rookie Award...Was named to the Topps Company's 50th annual Major League Rookie all-star team as the shortstop...becomesthe 14th player in the franchise's 40 seasons to be named to the elite team and the second shortstop (AngelBerroa, 2003)...Was the Royals' nominee for the Hank Aaron Award, given to the best overall offensive performer in eachleague...The Royals went 52-50 after he was inserted as the regular shortstop on June 6...the club was 23-37 prior toJune 6...Led all Major League rookies with a .325 batting average, while also fi nishing among the A.L. rookie leadersin nearly every other offensive category, including second in multi-hit games (39) and on-base pct. (.354), thirdin hits and runs, and fourth in doubles, total bases (201) and slugging pct. (.480)...Recorded the highest rookie batting average in Royals history (min. 400 at bats), surpassing hitting coach KevinSeitzer's .323 mark in 1987...fi nished with the second-best on-base pct. (Kevin Seitzer, .399) and slugging pct. (Mark Quinn, .488 in 2000)...His .325 average was the 12th-highest average in Royals history (min. 400 at bats)...Posted 39 multi-hit games in 102 contests, including 12 3-hit games and four 4-hit games...Finished third in the A.L. and fi fth in the Majors with a .3587 (66-for-184) average with men on base...teammateDavid DeJesus was fourth in Majors at .3591 (65-for-181)...Also starred defensively, posting the fi fth-best fi elding pct. (.974) among A.L. shortstops (min. 90 games), thefourth-best range factor/9 innings (4.56) and the second-best zone rating (.849)...Was incredibly consistent through his fi rst 4 months in the Majors, hitting .330 in June, .330 in July, .339 inAugust and .308 in September...won KC Player of the Month in both July and August...hit .348 (49-for-141)with a .575 slugging pct. against lefties...Started the season at Triple-A Omaha and was hitting .336 (72-for-214) with 21 doubles, 6 triples, 10 homers,42 RBI and 42 runs scored in 50 games with the O-Royals at the time of his call-up...Was selected from Omaha on May 29...made his Major League debut that night vs. Minnesota...He recorded his fi rst Major League hit, a double in the third inning at Yankee Stadium on June 6 with friendsand family looking on...He hit a game-tying 2-run home run off of Texas' Eric Hurley at home on June 12, Mike's fi rst Major Leagueblast...Was named A.L. Co-Player of the Week (X. Nady-NYY) from July 28-August 3 after hitting .577 (15-for-26)with 4 games of at least 3 hits...Recorded a career-high 12-game hitting streak from July 7-22, hitting .423 (22-for-52) with 10 RBI...posted 4hitting streaks of 7 or more games on the season...Finished the season strong, leading all MLB rookies with 33 hits in September, trailing only George Brett (35)among Royals rookies...scored 22 runs in the month, tied for the third-most ever among KC rookies. Had a tremendous season at Omaha (AAA) and was rewarded by being named both the Omaha Player of the Year and Kansas City Minor League Player of the Year...also won Player of the Year honors with the Surprise Royals in 2003...Led the O-Royals in RBI, runs, hits, at bats and triples...posted a .320 (47-for-147) average with a .510 slugging pct. against left-handed pitchers...also hit .310 (45-for-145) with runners in scoring position and .467 (7-for-15) with 2 home runs in extra innings...played at second, third and shortstop...Played for Aragua in the Venezuelan Winter Leagues, hitting .299 (61-for-204) with 13 doubles, 2 triples, 6 home runs and 27 RBI in 56 games. Made his Triple-A debut, spending the entire season with Omaha...Struck out an average of once every 10.46 plate appearances (502 PA), the 5th-best ratio among Pacific CoastLeague qualifiers...Played primarily 3rd base (95 games)...Also appeared at shortstop (15 games) and 2nd base (1 game)...Hit .317 (40-for-126) over his final 34 games of the season beginning 7/28...Batted .308 (32-for-104) whenleading off an inning and went 5-for-15 (.333) with the bases loaded. Spent the entire season with Double-A Wichita and was named both a mid- and postseasonTexas League All-Star...Led the Wranglers while ranking among league leaders in extra-base hits (T-3rd, 53), doubles (4th, 33) andat-bats (4th, 521)...Also topped the club in runs (79) and hits (146)...Appeared at shortstop (102 games), 3rd base (20) and 2nd base (12)...Had an 11-game home hitting streak from 5/25-6/17 and a 10-game road streak from 8/6-26...Ranked 4th in the circuit with a .348 clip (32-for-92) in June...Tied for 4th with 20 RBI in the month. Made his Triple-A debut, spending the entire season with Omaha...Named to both the circuit's mid-season and post-season All-Star teams...Also earned team Player of theYear honors...Paced the league with 40 doubles, which set a franchise record...Also finished 3rd in the league in extra-base hits (50) and tied for third in hits (139). Named MVP of the Rookie-level Arizona League as well as Royals AZL Player of the Year...Helped the Royals club to the AZL Championship with a league-leading 19 doubles and 51 runs...Also rankedamong AZL leaders in hits (T-2nd, 77), extra-base hits (T-3rd, 30), AVG (4th, .363) and SLG (4th, .585)...Selected to Arizona League All-Star Team at shortstop and named by Baseball America as a Short-Season All-Star...Tabbed by Topps as its Arizona League Player of the Month for August. November 2, 2017 SS Mike Aviles elected free agency. July 25, 2017 Miami Marlins selected the contract of SS Mike Aviles from New Orleans Baby Cakes. May 19, 2017 Miami Marlins sent SS Mike Aviles outright to New Orleans Baby Cakes. 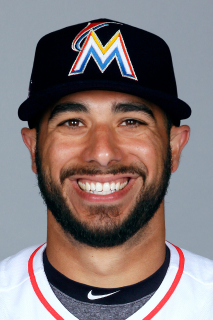 May 17, 2017 Miami Marlins designated SS Mike Aviles for assignment. May 12, 2017 Miami Marlins selected the contract of SS Mike Aviles from New Orleans Baby Cakes. May 11, 2017 SS Mike Aviles assigned to New Orleans Baby Cakes. May 4, 2017 Miami Marlins signed free agent SS Mike Aviles to a minor league contract. April 30, 2017 SS Mike Aviles assigned to New Orleans Baby Cakes. August 21, 2016 Atlanta Braves released SS Mike Aviles. August 17, 2016 Atlanta Braves designated SS Mike Aviles for assignment. August 16, 2016 Atlanta Braves traded SS Erick Aybar to Detroit Tigers for Mike Aviles and C Kade Scivicque. December 18, 2015 Detroit Tigers signed free agent SS Mike Aviles. November 2, 2015 SS Mike Aviles roster status changed by Cleveland Indians. July 16, 2015 Cleveland Indians activated SS Mike Aviles. July 11, 2015 SS Mike Aviles roster status changed by Cleveland Indians. May 18, 2015 Cleveland Indians activated SS Mike Aviles from the restricted list. May 15, 2015 Cleveland Indians placed SS Mike Aviles on the restricted list. May 8, 2015 LF Mike Aviles roster status changed by Cleveland Indians. October 30, 2014 SS Mike Aviles assigned to Cangrejeros de Santurce. October 30, 2014 Cangrejeros de Santurce placed SS Mike Aviles on the reserve list. October 31, 2013 SS Mike Aviles assigned to Cangrejeros de Santurce. November 3, 2012 Cleveland Indians traded RHP Esmil Rogers to Toronto Blue Jays for LF Mike Aviles and C Yan Gomes. October 21, 2012 Toronto Blue Jays traded RHP David Carpenter to Boston Red Sox for SS Mike Aviles. July 30, 2011 Salem Red Sox Traded RHP Kendal Volz to Wilmington Blue Rocks; Boston Red Sox Traded 3B Yamaico Navarro to Kansas City Royals and Kansas City Royals Traded SS Mike Aviles to Boston Red Sox. July 20, 2011 Kansas City Royals recalled Mike Aviles from Omaha Storm Chasers. June 10, 2011 Kansas City Royals optioned Mike Aviles to Omaha Storm Chasers. May 3, 2010 Kansas City Royals recalled Mike Aviles from Omaha Royals. April 11, 2010 Kansas City Royals optioned Mike Aviles to Omaha Royals. November 16, 2009 Mike Aviles roster status changed by Kansas City Royals. November 11, 2009 SS Mike Aviles assigned to Leones de Ponce. July 7, 2009 Kansas City Royals transferred SS Mike Aviles from the 15-day disabled list to the 60-day disabled list. May 24, 2009 Kansas City Royals placed SS Mike Aviles on the 15-day disabled list. Strained right forearm.